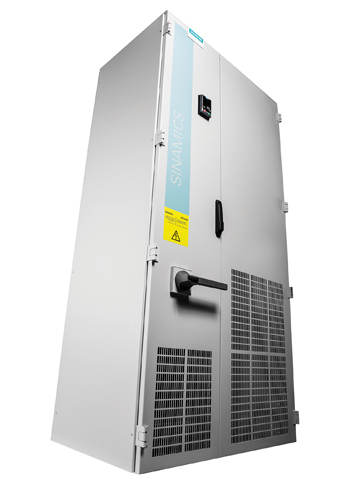 Siemens is now offering an extended power range up to 560 kilowatts for the 400 volt versions of its Sinamics G120P Cabinet converter. The integrated special functions for pump, fan and compressor applications such as pump cascading, multi-zone control and smoke exhaust mode, as well as full integration into the Totally Integrated Automation (TIA) portal all serve to reduce the time required for engineering by up to 30 per cent. The ready-to-connect cabinet converter comes with a broad selection of options which customers can simply pick out of a catalog. All commonly used filtration options, mechanical options and increased protection rating are all available. The documentation is available in a variety of languages, and the cabinets are delivered ready for connection on pallets. The rugged design means that the converter is also suitable for use in harsh industrial environments. The new converter series provides an outstanding efficiency level of 98 per cent, certified in line with the new Energy Efficiency Standard EN 50598. This makes it extremely economical in terms of energy consumption, significantly lowering operating costs and also making for a reduced carbon footprint. Depending on the operating mode, different power consumption optimisation options are offered, ranging from dedicated reduction of the magnetic flow in powered electric motors, optimized output pulses or an economical standby mode. Many of these optimising touches also help to reduce wear and tear. The rugged and maintenance-free design of the converter make it ideally suited for use in the most hostile of industrial environments, with the previously mentioned product benefits ensuring reliable, uninterrupted operation. Alongside applications in classical industrial environments, this product series is also particularly suited for use in the water and building industries. The converter cabinet unit is specifically tailored to simple uses such as pump, fan and compressor applications. User-prompted commissioning is extremely quick and simple using the Intelligent Operator Panel (IOP) integrated in the cabinet door, and the familiar and proven operating tools of the Sinamics series are additionally available for computer-based parameterisation. The power sections and components of the proven Sinamics G120P Cabinet series can also be ordered separately, allowing customers building their own control cabinets to make use of the same product benefits. These include also the optimum interaction of Sinamics converters and Simotics motors. The Integrated Drive Systems (IDS) approach taken by Siemens AG ensures that the ideal coordination of the individual drive train components is taken into consideration right from the engineering phase. This allows the customer to reap the benefits of a perfect fit, outstanding energy efficiency and reliability when choosing components and also during subsequent operation.